Now here’s a secret, something I haven’t told anyone else. A secret about Dexter Theroux, the main male character in Death Was the Other Woman. No one has asked me why I settled him with “Dexter.” And it’s a pretty good question: one especially apt for this venue. So why Dexter? Why not David or Michael or John -- one of those good old saint names that pull so much use. Was something more off-beat called for? Then Percival might have had the same effect. Or Archibald could have served. But the truth is this: at the very moment that the book that would become Death Was the Other Woman was pouring itself into my brain, I was dogsitting my friend Pam’s canine companion. And this dog was a rakish old gentleman: an Australian She pherd-cross-something-wirey. He had seen his share of summers, this old guy, his coat was thin in spots and his joints could be a bit sore in the morning, but there was something ineffably cool about him. You really got that, if he was a music lover, he’d listen to jazz. And not just any jazz, either. But the kind of cool jazz popularized by Miles Davis and Dave Brubeck. Something that calls for wearing a beret and a slouchy, stripey shirt. We’d go for walks and he’d be very self-possessed. My own dog, Jett, would be bouncing around, trying to get him to play, and he would play with her, a little indulgently. But there was never any question but that he was thinking his own thoughts and preparing to do his own business. He was courteous to Jett, you understand -- even if that courtesy was sometimes tinged with an aloof superiority that he came by very honestly -- but it was clear that he was focusing on larger issues. And this dog -- of course, and you’ve guessed it by now -- this dog was named Dex. While he’s there, snoring softly, this character waltzes into my manuscript. I recognized him as soon as he walked in. He is tall and good-looking in a 1930s movie star kind of way. But he’s damaged and if you look closely, you can see it in his eyes. And though he’s damaged and even self-medicating, there is a core of moral strength that is sometimes difficult to see. What’s not difficult to see: he’s done some living in those shoes. The character I was creating is not now a Southerner, but when I first saw him, I thought he was. And because I was writing him, he needed a name right now. When I’m working, my characters must have names in the first instant. The names don’t always stick, and sometimes they go through quite a few changes before I’m done, but this one has stuck just as it came out of my brain that day, with the borrowed dog snoring gently near my feet: Dexter J. Theroux, which seemed to me to be a good name for a damaged Bourbon-sucking Southerner. After a while, though, I realized that for Dexter to have sustained the kind of damage I required, he probably could not have been an American. The United States got into WW I quite late in the game and I wanted this character to have suffered in the trenches for years. In the end I made him Canadian, which was not a big stretch. In the first place -- and arguably -- Canadian soldiers saw the very worst of that war. The powers that be used the Canadian boys as disposable fighting commodities: you could put them into difficult positions (along with Australians and maybe the Scots) because it didn’t matter as much whether you got them out. And there were a lot of Canadians living in California in those years. Like, an almost unthinkable number. It was not at all outside of the realm of possibility for Dex to be a Canuck. I did not give him a Quebecois heritage, but I’ve left it open enough that it’s a possibility, especially given the name. 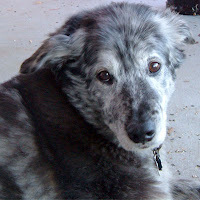 Now Dex -- the original Dex, he of the snores and the scratchy, wirey coat -- passed onto the rainbow bridge in the summer of 2006, just as I was riding the book that would become Death Was the Other Woman to the finish line. The loss of him left a hole in the world in the place where he used to be and it left a void at the side of the writer whose clacking he heard most often. He does not live on in my novel. That would be silly. A man shouldn’t be a dog. But a bit of him? Maybe a bit of him. The spirit of a too-cool-for-school Dexter, who’s seen enough of life, you can’t impress him anymore, that Dexter lives on in my book, and in her heart. I just blogged about names in crime fiction too. It's fascinating to read about author's personal choices, but then there's the whole "just like the sound of it."